We have a Vision for Birmingham to make it a city of inclusive growth where the opportunities and benefits of progress and investment are felt by all. 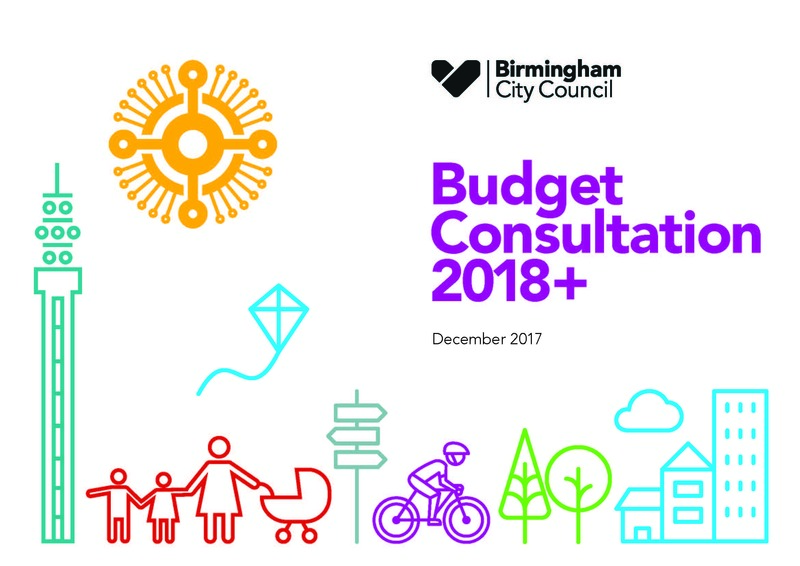 Contact Budget_Views@birmingham.gov.uk with any questions. Since 2010 the Council has had to make cuts of over £642m and we know that we need to go further if we are to tackle the challenges facing the public sector. We face huge decisions, but there are also opportunities for us to look at how we can better deliver our services to suit the changing needs of our citizens. Your views really do matter when we make these tough decisions. A Business meeting – also for large city institutions on the 10th January – at breakfast time. This will be held in the Chamber of Commerce ( 8.15 am- 9.30 am). If you would like a shorter version of the budget consultation document, this can be found in the 'related documents' section below. If you’re not able to fill in the survey online, you can use the print version of the survey, found in the related documents section below. Details of where to return this to are included at the end of the survey.